LASP Engineering uses major computer-aided design tools, such as SolidWorks, for design. PDMWorks and Agile are used for managing drawings and product specifications. Microsoft Project is used to generate schedules and maintain status. Telelogic’s DOORS software is used to track requirements. ZEMAX, FRED and IRT are use as optical design tools. LabView and Matlab are widely used to automate tests. A wide variety of computer-aided engineering tools are used for modeling and analyzing mechanical, electrical, and thermal performance. Even the tools used to create our science instruments are now computerized: LASP has two large numerical control machine tools for producing instrument casings and other components with extreme accuracy. 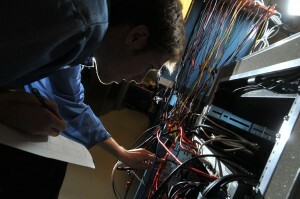 Much of the test equipment used by our engineers is computerized and monitored and controlled online. The scientific instruments that we create are all controlled by software and firmware developed by LASP engineers and programmers and their code is carefully designed and thoroughly tested to assure ultra-high reliability in a demanding real-time operating environment.